Francois Dumont, Marie Antoinette. 1780, portrait miniatures (5x3 in. ), ivory. Image from slide, University of California, San Diego. This pathfinder is for anyone who wants to learn more about Marie Antoinette. You may also want to check out my list of Books on the 18th Century. If you are interested in using and finding images please see my Image Research Guide. Marie Antoinette, born (ready for this?) archduchess Maria Antonia Josepha Johanna von Habsburg- Lorraine, grew up in Austria with twelve brothers and sisters. Her mother was Maria Theresa, the Empress of Austria, and her father was the Holy Roman Emperor. When she was just fourteen years old she left her home to marry the Dauphin of France, destined to be the future Queen of France. She left all of her possessions to move to France (yes even her pup!) where she would live the rest of her life. Marie Antoinette's life as queen was brief and ended with the French Revolution. She is best known for her role as a carefree, profligate young Queen, her influence on fashion, her relationships with members of the aristocracy and the famous phrase "let them eat cake" which she never actually said! I have selected sources that are available from libraries or online, and I have provided links, when available, for the convenience of users. Some articles from academic databases may not be available through all libraries but they most likely can be obtained through your local library's interlibrary loan service. "Marie Antoinette." Funk & Wagnalls New World Encyclopedia, Provides a brief and general entry on Marie Antoinette, who she was and a little bit about her reign. 2010. "Marie Antoinette." Columbia Electronic Encyclopedia, 6th Edition 1. A short description of Marie Antoinette, her birth and titles while in France. Also discusses her reign as Queen of France. Campan. 2008. The private life of Marie Antoinette. Stroud, Gloucestershire: History Press. This book is by Madame Campan who was the reader to the Royal Princesses. A Royalist through and through, this book discusses her encounters with the Queen, (again it is most favorable as she was fond of the Royal family). Castelot, Andre. 1957. Queen of France; a biography of Marie Antoinette. New York: Harper. Castelot's books are great. This is a good general biography of the queen, a very easy read. Cronin, Vincent. 1975. Louis and Antoinette. New York: Morrow.Louis and Antoinette focuses on the young couple, whom began their life together as dauphin and dauphine of France, only to be thrown into the roles of King and Queen at an all too young age. Aside from the political stress of their jobs, marital problems were also present. Cullen, Lynn, and Amy Young. 2006. Moi and Marie Antoinette. New York: Bloomsbury Children's Books. Told from the eyes of Marie Antoinette's pug, this children's book is a very fun mini biography of Marie Antoinette. Ages 5-11. Erickson, Carolly. 1991. To the scaffold: the life of Marie Antoinette. New York: W. Morrow and Co. This biography of Marie Antoinette focuses on the rising revolution and the role slander and Marie Antoinette's actions played leading up to her execution. Fraser, Antonia. 2001. Marie Antoinette: the journey. New York: N.A. Talese/Doubleday. This widely loved biography by Antonia Fraser tells the tale of Marie Antoinette, from her childhood home in Vienna to her two week journey to France. The Journey continues as she gains a new French home and family until she is forced to leave it when she is just in her thirties. Lever, Evelyne. 2000. Marie Antoinette: the last queen of France. New York: Farrar, Straus and Giroux. This biography emphasizes Marie Antoinette's life in France, her life with her husband, treatment of politics and balance of friendship and public persona. Loomis, Stanley. 1972. The fatal friendship; Marie Antoinette, Count Fersen and the flight to Varennes. Garden City, N.Y.: Doubleday The dramatic escape planned to save the Queen and King during the French Revolution is recounted in this book by Stanley Loomis. Count Fersen, close friend of the Royal family played a significant role in the escape plan that went terribly wrong. Nagel, Susan. 2008. Marie-Therese, child of terror: the fate of Marie Antoinette's daughter. New York: Bloomsbury. Marie Therese is the first daughter of Marie Antoinette and Louis XVI. The child grew up in the loving arms of her mother, lived at Versailles and lived through the terror where she lost all of her family. The book discusses her life but mainly the life she lived after the French Revolution. Plain, Nancy. 2002. Louis XVI, Marie-Antoinette, and the French Revolution. New York: Benchmark Books. This book is aimed for children and young teens interested in the life of Marie Antoinette during the French Revolution. It is written in an entertaining manner with lots of great descriptions of the people and events that occurred during Marie Antoinette's life. It is short and to the point, only 88 pages long! Price, Munro. 2003. The road from Versailles: Louis XVI, Marie Antoinette, and the fall of the French monarchy. New York: St. Martin's Press. In this scholarly work by Munro, the author discusses in great detail the political powers and motives in France at the time of the French Revolution. Vovk, Justin C. 2009. In destiny's hands: five tragic rulers, children of Maria Theresa. Raleigh, N.C.: Lulu, Inc.This book features the five very different stories of five of Empress Maria Theresa's children. These five, archdukes and archduchesses all married to become rulers in countries around Europe, each with an interesting story of their own! Weber, Caroline. 2006. Queen of fashion: what Marie Antoinette wore to the Revolution. New York: H. Holt. Weber's 2006 title discusses the role fashion played in Marie Antoinette's life. How did she use it to her advantage? What did she do that influenced fashion? How could fashion ruin her image, and how did it? All these interesting questions are addressed in this book. Bashor, Will. 2013. Marie Antoinette's Head: The Royal Hairdresser, The Queen, And The Revolution. Guilford, Connecticut : Lyons Press. Marie Antoinette's hair stylist, Leonard Autie, had so much influence even the queen's friend Georgiana, Duchess of Devonshire was aware of him. Through careful research utilizing court documents, records and Leonard's memoris, Bashor has pieced together a very interesting work about Leonard and life at court in 18th century France. "Marie Antoinette, PBS." PBS: Public Broadcasting Service. http://www.pbs.org/marieantoinette/ (accessed April 12, 2011). Excellent resource on Marie Antoinette including an interactive timeline about her life from childhood through death. "Marie Antoinette's Estate." Chateau Versailles. http://en.chateauversailles.fr/marie-antoinettes-estate (accessed October 20, 2014). This authoritative website features a section on Marie Antoinette's estate, Petit Trianon, where she spent much of her free time. Barker, Nancy N. 1993. "`Let them eat cake: The mythical Marie Antoinette and the French Revolution." Historian. 55 (4): 709. Marie Antoinette's famous non-statement of the French Revolution is "Let them eat cake!" This article discusses the origins of this 'mythical' statement. Ferriss, Suzanne and Mallory Young. 2010. 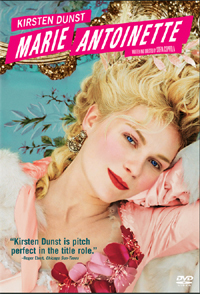 "Marie Antoinette": Fashion, Third-Wave Feminism, and Chick Culture." Literature Film Quarterly. 98-116. Salisbury University, 2010. This contemporary article discusses the surge in popularity of the doomed queen Marie Antoinette after the release of Sofia Coppola's 2006 movie, Marie Antoinette. Why do we connect with this tragic figure who lived 200 years ago? Her life story, her role in politics and as wife and mother are some of those reasons. Hosford, Desmond. 2004. 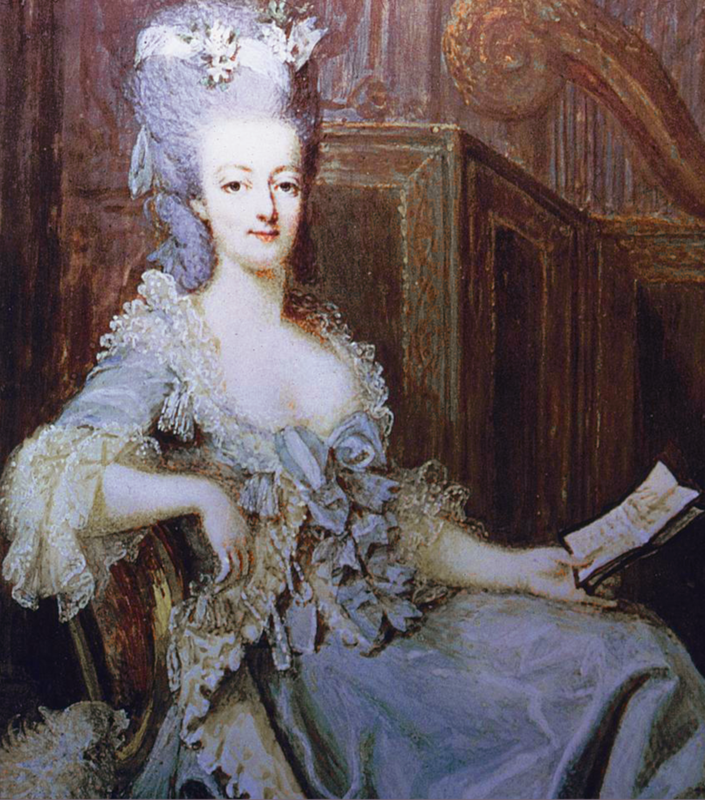 "The Queen's Hair: Marie-Antoinette, Politics, and DNA". Eighteenth-Century Studies. 38 (1): 183-200. This article looks at the DNA connections between samples of DNA found in Marie Antoinette's hair and that of the so called 'heart' of the young dauphine. The death of her son in prison has been surrounded by mystery and by comparing DNA to his remaining heart and Marie Antoinette's hair connections were hoped to be made. Dairy Queens: the politics of pastoral architecture from Catherine De Medici to Marie-Antoinette. Patarin, Jacques, and Valerie Nachef. 2010. "“I Shall Love You Until Death” (Marie-Antoinette to Axel von Fersen)." Cryptologia. 34(2): 104-114.﻿﻿﻿﻿ This article explores the encryption of correspondence between Marie Antoinette and Count Fersen during the years of the French Revolution. These letters had to be encrypted for protection of parties and any other secrets. Coppola, Sofia, Ross Katz, Kirsten Dunst, Marianne Faithfull, Steve Coogan, Judy Davis, Jason Schwartzman, et al. 2007. Marie Antoinette. Culver City, Calif: Sony Pictures Home Entertainment. 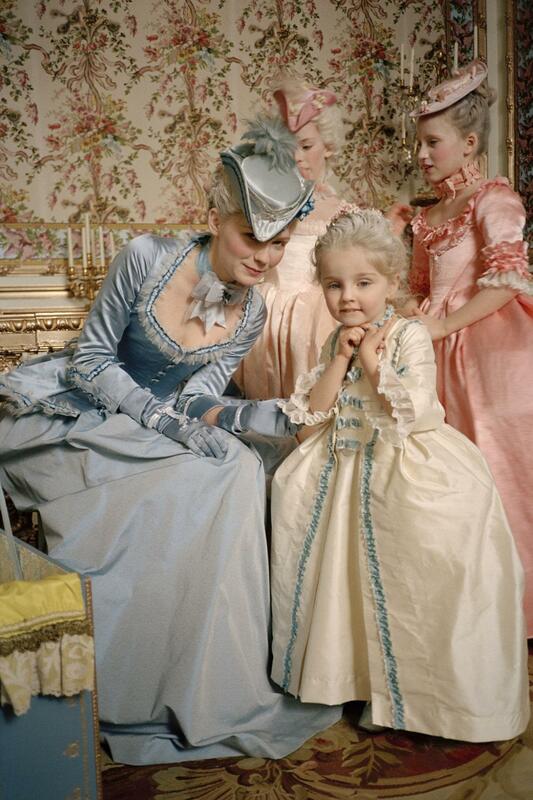 The 2006 film is set in the amazing rooms of Versailles, the stunning imagery, sets and costumes set the scene for this psychological glimpse into Marie Antoinette's life, based on Antonia Fraser's biography The Journey. Grubin, David, Blair Brown, and Michael Bacon. 2006. Marie Antoinette. [Arlington, VA]: PBS Home Video. 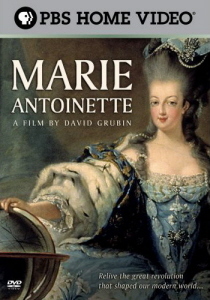 This film tells a sympathetic story of Marie Antoinette, as she moved from her childhood home to become a much adored political figure to a hated symbol of the old regime during the French Revolution. Van Dyke, W. S., Hunt Stromberg, Claudine West, Donald Ogden Stewart, Ernest Vajda, Norma Shearer, Tyrone Power, et al. 2006. Marie Antoinette. US : Turner Entertainment. This classic film starring Norma Shearer gives a Hollywood take on the life of Marie Antoinette with a special focus on the Diamond Necklace Affair, which was left out of the 2006 movie.